Dale Lane and Ronan resident Butch Berland talk about some carpet belt suspenders Berland brought in for repair. 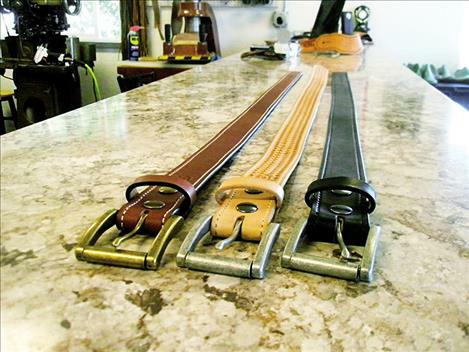 Some of the belts that Dale Lane makes are for sale in his store, located next to the UPS Store. POLSON – Something’s afoot in Polson. 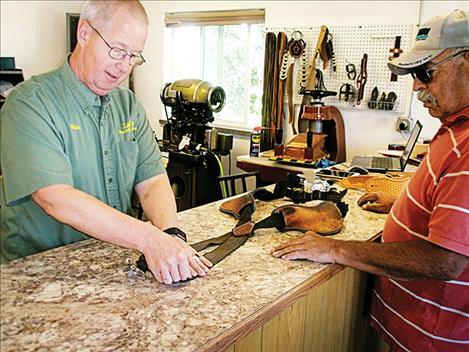 Dale Lane – who opened Cowboy’s Toys in Ronan 1990 and sold the business to Steve Krum in 2000 – has brought a boot and shoe repair business back to town. Lane, 55, and a Ronan native, opened Lane’s Boot and Shoe Repair April 3 at 48901 U.S. 93, next to the UPS Store. Lane went to work at a hardware store in Kalispell after moving there in 2000 but got back into the business in 2009 when he purchased Cal’s Boot and Shoe Repair. 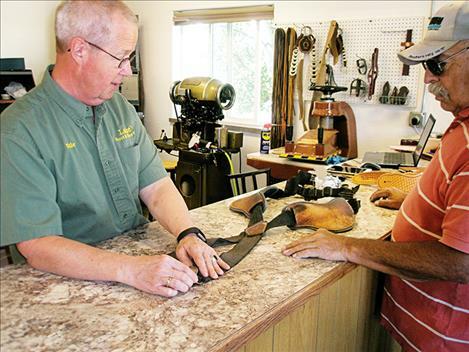 Lane’s may be the first boot and shoe repair business in Polson since Outlaw Saddlery went out of business in the 1980s, he said. Such a business is a good fit for any town, he said. The variety of things he works on keeps his job interesting, and he also enjoys interacting with the public. In addition to boots and shoes, some examples of the things Lane makes or repairs include: spur straps, headstalls, chaps, gun holsters, purses and handbags. Probably 90 percent of his clients are repeat customers, he said, noting some have followed him from both his Ronan and Kalispell stores. His wife, Carmen, has received plenty of leather goods over the years as gifts, Lane said. He’s made her hair barrettes, belts and checkbook wallets, for example. Lane mainly works with leather but also nylon and canvas, and he recently repaired a water flotation device. He has five sewing machines at his disposal and he uses all of them, including a 1960s-era Sutton sole stitcher. His goal is to eventually start making boots. Business hours are 9 a.m. to 5 p.m., Monday through Friday, and 9 a.m. to 1 p.m. on Saturday. He can be found on Facebook as “Lane’s Boots & Saddle.” His phone numbers are 406-883-5263 (office) and 406-249-5844 (cell).